Spring Clean up: The start to a new landscaping season! During this service salt and grit deposits from edges of lawn will be removed. All debris, sticks, and leaves will also be removed from your lawn. 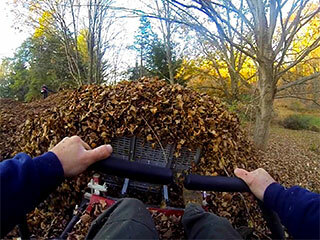 Mulch beds and any parking areas will be cleared of leaves. Your lawn will be mowed and grass clippings will be removed to get your property up to par for the new season. 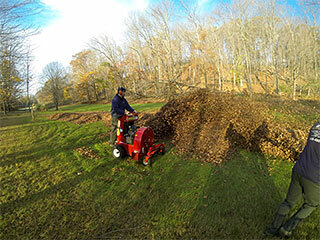 Fall Clean up: Clean up of all debris, sticks, and leaves will be done at the end of the landscaping season. Your lawn will also be mowed and grass clippings picked up. Fall clean ups are important because it ensures your property is in the best shape possible going into the harsh winter weather. A quality annual fall clean up also reduces the cost of spring clean ups. Storm Clean up: Recently our area has seen more storm damage than in years past. Dealing with possible power outages, flooding, and damage to your house is more than enough to keep homeowners busy after a storm hits our area. The last thing you want to do is think about dealing with a yard littered with sticks, branches, or possibly whole trees. During this service our experienced crew will remove all debris from your property. All of this can be taken care of by JB’s Landscaping. If necessary we can cut up trees, stack the wood for you (if you have a wood burning stove or fireplace), haul it away, or send it through our wood chipper.